Joachim’s distinctive style is impossible not to notice. His signature multiple eyes, amusing characters and prominent teeth in colourful twisted compositions decorate the streets in his home country of Belgium and across all of Europe. He now brings his unique style to canvas, and 19 Karen is excited to bring this artist’s work exclusively to Australia. 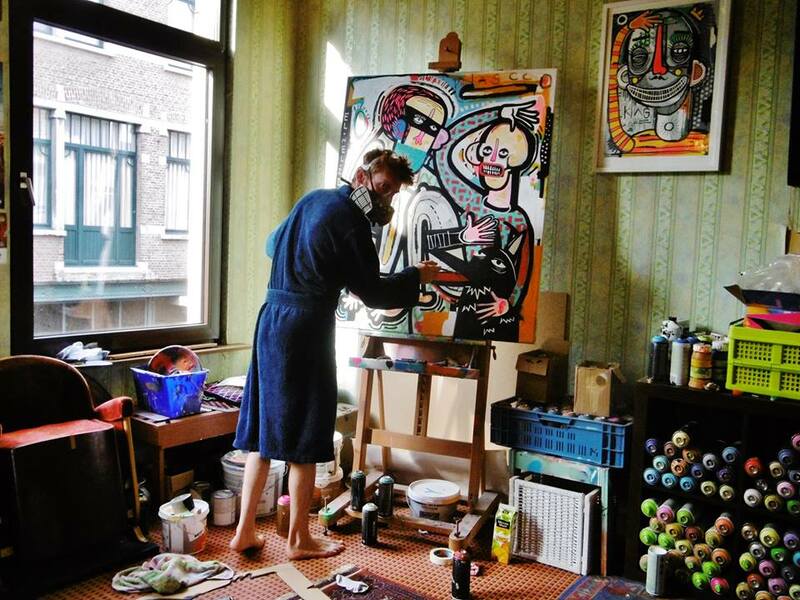 Joachim is a young Belgian urban artist from Antwerp. 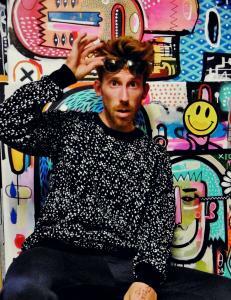 Passionate about drawing and painting from his earliest years, Joachim caught the graffiti bug in the 1990s, when he discovered Street Art as a six-year-old boy on the streets of Antwerp. Around that time, graffiti art was pretty basic, “old school”, the diametric opposite of the creations we see produced today; but Joachim was hooked. He wanted to be a graffiti artist! After studying at art school, Joachim linked up with a group of graffiti artists and learnt a great deal from this shared experience. He began experimenting with different approaches to Street Art, while also painting on canvas, which would become his principal focus as the years went by. He actually made the canvases himself, using materials that he found in the street for the most part: making things from scratch has come to be Joachim’s trademark. In 2010, he began renting his own studio. While continuing to take advantage of the expressive possibilities of street art and its large surfaces, Joachim also enjoys making small-scale works that are more intimate than the ones he creates on walls, for general viewing. In the confined space of his studio, he is more at liberty to tinker with elements of style. Over the years, Joachim has developed a spontaneous way of working and a style that is utterly distinctive. His strong lines and colour contrasts, in addition to the recurrent motifs involving figures with highly stylised eyes and over-size teeth, are typical components, and his playful compositions, with their twisted and tangled forms, bear some similarity to certain Cubist works. No one can mistake one of Joachim’s creations! Following a promising start in Belgium, this enthusiastic and energetic young artist has gradually been pushing back the frontiers and making a name for himself on the international Street Art scene. For a number of years now, he has been contributing to major projects alongside leading exponents of the movement. 2000-2003 Joachim follows an artistic education at the Art School of Antwerp. After having to redo the same year three times after each other, he is sent from school. 2010 After years of walking around aimlessly, he resigns his former job and begins to rent a room in an old school that he converted into a studio. From then on, Joachim spents all his time on his art and begins to experiment with all sorts of techniques. After a while he discovered a style he calls ‘his one’. 2014 The Antwerp gallery Aim Space hosts his first solo exhibition, entitled Krank. 2015 His work is noticed by ‘Graffitistreet’ (a London-based street art gallery) He joins the gallery and begins to gain international recognition. 2015 He is involved in a group show in London entitled Underground organised by Graffiti Street, where he meets several world-famous street artists such as Pichi&Avo and Bordalo II. 2015 Joachim holds a second solo exhibition, entitled ‘BIPOLAR in ‘BRATO gallery’ Anwterp. The show is a success. 2016 He curates the project Lier Up, inviting 11 wellknown street artists artists, among them Bisser, 2Dirty, Niels Westergard and Bird, to give the walls of ‘Lier’ (a small city near Antwerp, where he lived for years) a face lift and breathe some modernity into this picturesque little city. 14 large-scale unique murals (designed to be permanent) are scattered across Lier, totally transforming the place. 2017 Joachim has been commissioned by the Italian fashion brand MOA (Master of Arts) – which specialises in bringing together fashion and art – to create an exclusive motif for their shoes. 2017 Joachim is being asked for a unique project, curated by Huberty Breyne Gallery and ‘The Cristal Ship. It will be his biggest solo expo until then. The Huberty & Breyne Gallery is moving from its current location in the Quartier du Sablon to Place du Châtelain in early 2018, and the street artist Joachim is being given carte blanche to celebrate the occasion. Joachim will be creating an ephemeral work occupying the entire ground floor of this 1,000 m2 former gymnasium. His project will be on view to the public from the 21st of April to the 19th of May 2017, prior to the start of renovations. 2017 Joachim joins the Australian Gallery – 19 Karen Contemporary Artspace. Especially for the gallery he makes 4 new works on canvas.